Location: Galway Bay in County Galway, Northern Ireland. Notes: Dunguaire Castle is a 16th-century tower house on the southeastern shore of Galway Bay in County Galway, Ireland, near Kinvarra (also spelled Kinvara). The name derives from the Dun of King Guaire, the legendary king of Connacht. 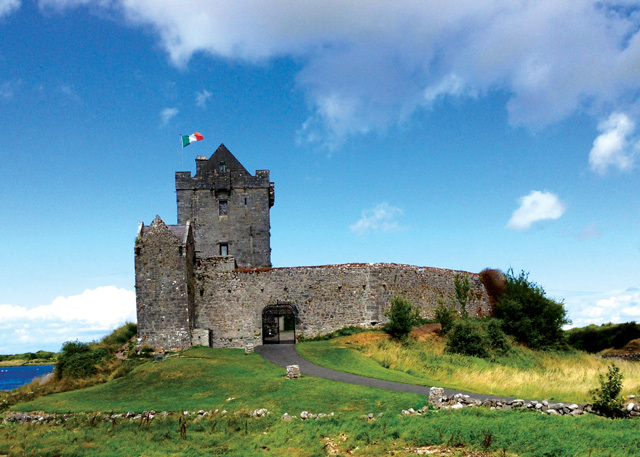 The castle's 75-foot tower and its defensive wall have been restored, and the grounds are open to tourists during the summer. The 19th century Gaelic scholar John O'Donovan states in his Ordnance Survey letters for County Galway and his book The Genealogies, Tribes and Customs of the Hy-Fiachrach that Dunguaire was built by the O hEidhin clan, chiefs of Coill Ua bhFiachrach, the district around Kinvara, and also of Ui Fiachrach Aidhne an area coextensive with the diocese of Kilmacduagh covering the part of county County Galway between The Burren and Galway Bay to the west and Slieve Aughty to the east. Dunguaire Castle was used in the 1969 Walt Disney movie Guns in the Heather, featuring Kurt Russell, in which the castle was featured as Boyne Castle. It was also the Scottish castle home of the main character in the 1979 film North Sea Hijack. Another regionally well known legend is the "Road of the Dishes" (Bothar na Mias), involving King Guaire and St. Colman of Kilmacduagh.